Matthew is vice president of operations for Spectrum Health Medical Group, where he has 12 years of experience leading a large integrated healthcare delivery system. His credentials include an Executive Masters in Leadership Degree from Georgetown University, a Bachelors of Science in accounting at Oakland University, and CPA licensure in the State of Michigan. Matthew has provided leadership to various organizations operating in Haiti for nine years. He has traveled to Haiti 16 times for different development efforts. As a result of his time in Haiti, he has gained an understanding of Haitian culture necessary to effectively execute programs in-country. Trillium Hibbeln currently serves as Executive Director the Power of Education Foundation. In her role, she's responsible for overseeing school operations, teacher training, and the monitoring of academic outcomes of the children we serve. 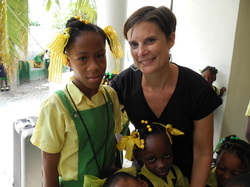 She also oversees the School-to-School Program, which empowers schools to get involved. Her credentials includes bachelor’s degree in international relations from Michigan State University and a master’s of education degree from The College of New Jersey. Trillium's professional life includes 15 years experience in nonprofit management, grants management, program development, and middle school education. Dr. Jeri Kessenich is an attending pediatrician at the Helen DeVos Children’s Hospital. She has a longstanding interest in global health and has done international medical relief work for more than 10 years, including her work in Haiti. Her role with the Power of Education Foundation includes leading volunteer medical and dental teams and assuming responsibility for the health of the student population to enable their ability to learn. Dr. Rebecca Heino is teaching faculty of management at the McDonough School of Business at Georgetown University, and is a certified leadership coach. Dr. Heino teaches courses in leading teams, management communication, social intelligence, leading change, critical conversations, cross cultural communication, and presentations for both MBAs and executives. Her global reach includes leading the South Africa Global Integrative for MBA students, teaching a course in India for Berlitz, and running a leadership summit for Cisco in Costa Rica and Argentina. She has also been a visiting professor in London for the University of Southern California, focusing on the study of global organizations and British media. Elizabeth Harless is a senior associate director of development at the Children’s National Health System, Center for Neuroscience and Behavioral Medicine in Washington, D.C. She is experienced in principal and major gift fundraising and campaign execution. Elizabeth is interested in all aspects of education and is dedicated to promoting fundraising priorities with leaders, volunteers, and donors. She has earned a Bachelor’s of Arts Degree in Women’s Studies and Communications and an Executive Masters in Leadership Degree from Georgetown University. Andrew Delinsky has seventeen years of independent school experience as a teacher and administrator. He is currently the eleventh Head of School at The Peck School is Morristown, New Jersey. Mr. Delinsky earned his Masters of Arts in English at Bread Loaf School of English at Middlebury College in 2003, following his Bachelor of Arts in English from Franklin & Marshall College in 1997. In 2013, Mr. Delinsky completed a Master of Science in Leadership at Georgetown University’s McDonough School of Business.